In 2010, Sean Ellis, coined the term growth hacker to make a noise all over the silicon valley. Back then, growing businesses was the job of VP Marketing, with big budgets and tremendous ads, they could generate more customers for businesses. However, Sean had a different point of view, he believed that it takes only a few innovative tricks with deep understanding of the business nature to achieve growth. While growth hacking might seem like a complex topic for those who encounter it for the first time, the practice of growth hacking is not what it seems. It doesn't require anything more than utilizing an out of the box thinking, no need for codes or highly technical skills. All that is required is outlining your hypothesis and measuring the results until you hit the desired targets. That means growth hacking is not a fixed strategy or a copy-paste schema. The techniques differ from one business case to another depending on the product/service and the business goals; however, the key is always in the mindset. 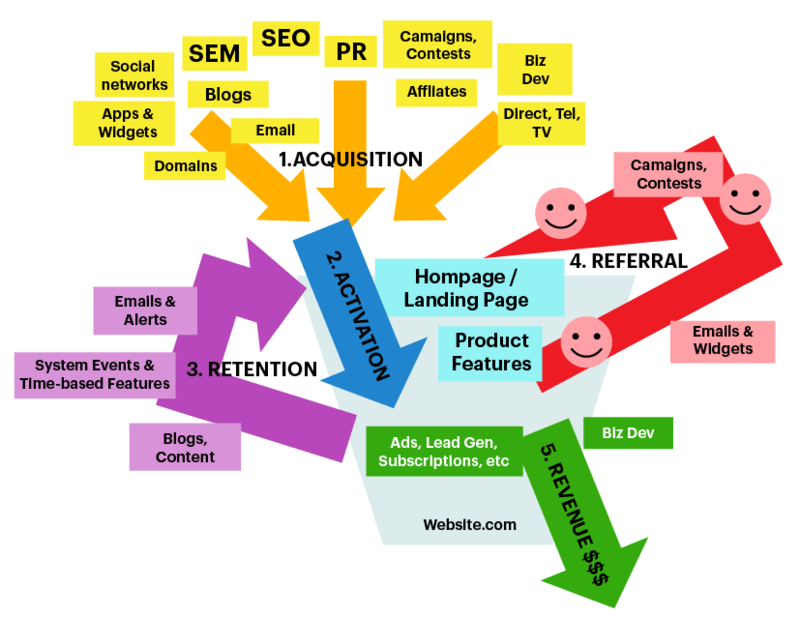 So what is exactly is growth hacking? While the old traditional ways targeted almost everyone with mass advertising, growth hacking came with a different methodology of spending less and going viral. Optimizing costs at the beginning, hooking niche segments and focusing on sustainability were the three things characterizing growth hacking. Growth hackers worked on lowering the costs per acquisition and making it meet the overall lifetime value. For instance, if gaining a new customer costs the business 5$ but the customer already pays 3$ and stays for two years in the cycle then that’s a winning situation. And here, you can notice that customer retention plays an essential role in growth, cause if you keep investing without a good retention, you will be spreading money and praying for success. Growth hacking happens by utilizing different types of marketing, production strategies, SEO techniques, email marketing and more. It can also involve social media viral content or community management. Product development is also influenced by growth hacking, but what growth hackers usually do is dropping off the lab coats and testing the product on ground with people. The secret is in fusing all these elements together to come up with a product/service that has everything built within. So the product/service growth is not only restricted to the marketing activities. This works perfectly in the digital era and internet based companies, where most products/services are intangible software and online services. So thinking of mass advertising for products won’t make the cutting edge. After all, these products play a role in its adoption. For instance, the experience Instagram provides is what keeps people coming back not the mass ads. So programmers, marketers, designers and almost everyone involved in the production process should be driven by customer experience if they desire growth. There is no specific job description or barriers between those who distribute the product and those who actually work on its development. Everyone knows a little about the others' roles. But if so, what makes a growth hacker different? “Growth hackers are a hybrid of marketer and coder, one who looks at the traditional question of 'How do I get customers for my product?' and answers with A/B tests, landing pages, viral factor, email deliver ability, and Open Graph." However, this changed now. Which means that a growth hacker doesn't necessarily have to be an engineer or even have a marketing degree. What matters is that person final focus although they still need to exist in a diversified team of marketers, coders. Of course marketers care about business growth as well, but not in the same manner as a growth hacker would. The true power here is the singularity in focus. So even with new marketing methodologies, like the inbound coined by Hubspot, it still can’t replace growth hacking techniques. We are not writing this to say that growth hacking better than marketing, they are just different with intersection in some practices related to SEO or email. However, a growth hacker and marketer share the same mentality for creativity, experimentation and analytics but they can never be a substitute for each other as there’s a key difference in the scope of goals. Maybe the beginning of the strategy is just a random idea, but what follows is always a data driven process. That’s what keeps growth hackers honest about their suggestions. Tracking the performance of every hack you implement is a must so you could keep those bringing you ROI and discard those that are not. Depending on your strategy the tracking tools are selected, for instance you can use mailchimp when utilizing mail or Facebook business manager when working on social media. Again, the tools will differ but the tracking will keep running. Analytics are also important for tracking success and implementing effective tactics as if you don’t know what made you gain 10000 new customers in 2 months, then you can repeat the same experiment again. It’s known that growth hacking is a cost effective way for building a company in a short period, but that doesn’t mean it requires no budget. It’s just the ability to adapt with limited budget that makes growth hacking different. Because eventually, all the public relations work and social media content is not generated from nowhere. It is the result of a working team and surely this team gets paid. As growth hacking depends on utilizing the existing resources, it doesn’t only optimize the money cost but also the human resources and machines needed. So it doesn’t require having an entire team of marketers, only one person with a creative mindset is enough. Well, there are some unethical practices for growth that includes gathering data illegally or spying on the competition. But what makes growth hacking really fun, is the uncertainty you experience through the process, the hard work on data analysis and pleasure you feel when you finally hit your desired target. Because growth hacking techniques mean lower costs for high profits, they were mainly used by startups at the beginning, but this is not the case today. Growth hacking is becoming the unicorn startups game. Also, big companies and enterprises started to gradually shift their direction towards growth in order to streamline a process that is centered around customer experience. And while growth is accused with inefficiency, the problem is how we actually use it. Thinking that the same methodologies will apply to both companies looking to grow its current customer base and earlier stage companies looking for a product-market fit is just a pinky dream. 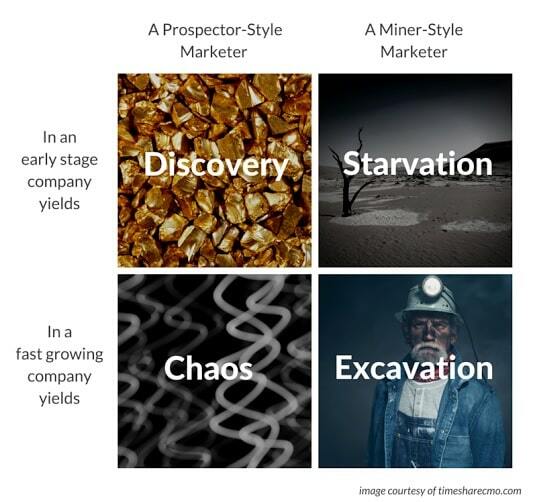 For these cases, you need to determine the phase you’re in to know whether you need a prospector or a miner. Prospector growth hackers are ideal for early stage companies that still don’t have a big investment. While Miner growth hackers work perfectly for companies that are looking for more growth through analyzing their data and building on the excavated insights. Back in the day, mass advertising campaigns could sell almost anything regardless of its quality or price. 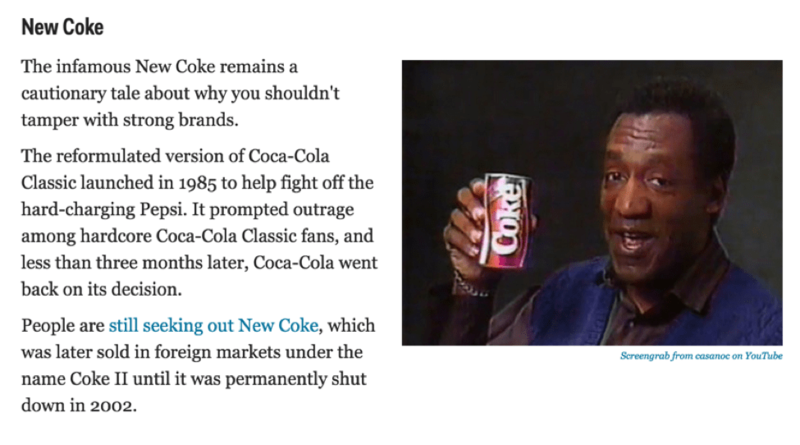 They could even inject unnecessary products into the daily life of consumers. But today, users have the awareness needed to identify their own needs and reject unmatched product. So the first step in entering any market is understanding whether your product would be of benefit to the people you’re trying to sell it to them. In a simple form, create something that people would want to buy or get ready for the worst days of your life. For example, Coca-Cola introduced lots of other soft drinks over the years like Sprite and Fanta, most of them didn’t taste as good as Coke. So how to make sure your product is needed? Test it. One of the best strategies for measuring the demand for your product/service is asking people to pay for it. You could also create a Facebook page or YouTube channel to build an audience for your product and start sharing tips and tricks from the insights you gained. If your free content is as unique as your product, you’ve already built a community ready to buy whatever you sell cause they will simply tell themselves, “ If that’s the quality of the free things provided, then the paid must be much better”. We understand your excitement about having your first product out. We know that you want to tell the whole world to know about the super genius thing you just made. But trust us, not the whole world care, only 15% may pay attention to what you’re proposing. 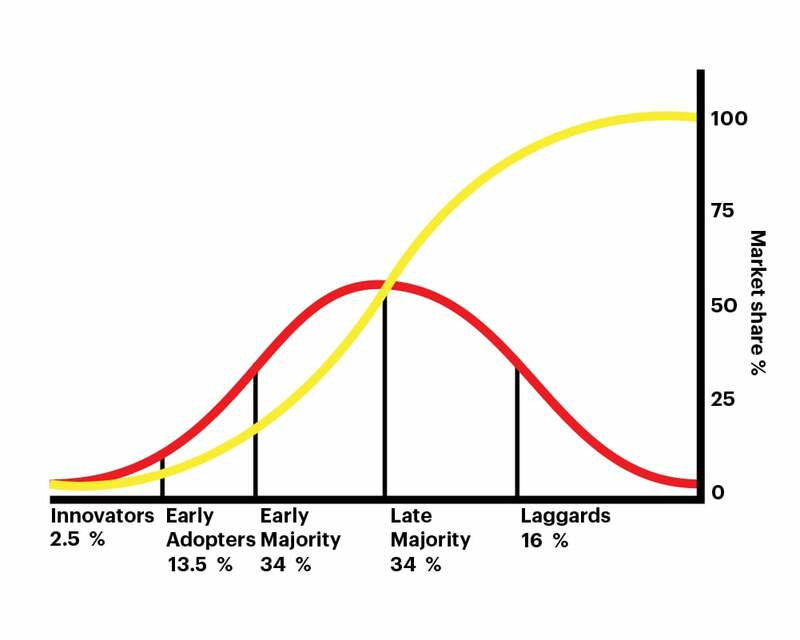 According to Everett Roger innovation diffusion curve, and the later studies of Geoffrey Moore in his book crossing the chasm, there are only two segments who might be eager to test your product when launched for the first time. Innovators, and the constitution 12.5% of the total world population and early adopters who make up 13.5%. And in order perfectly spot on your perfect customers, you need to create a customer profile that outlines their characteristics in detail. Having growth as a purpose is not sufficient, you need to set SMART goals to drive your success and keep measuring it and testing with a lean mindset until you figure out the best combination. And don’t be afraid of shuffling the whole strategy if needed. Trust the analytics not the guesses. He displayed the major points that people should focus on if they want to measure and optimize growth at each stage of the customer acquisition process. 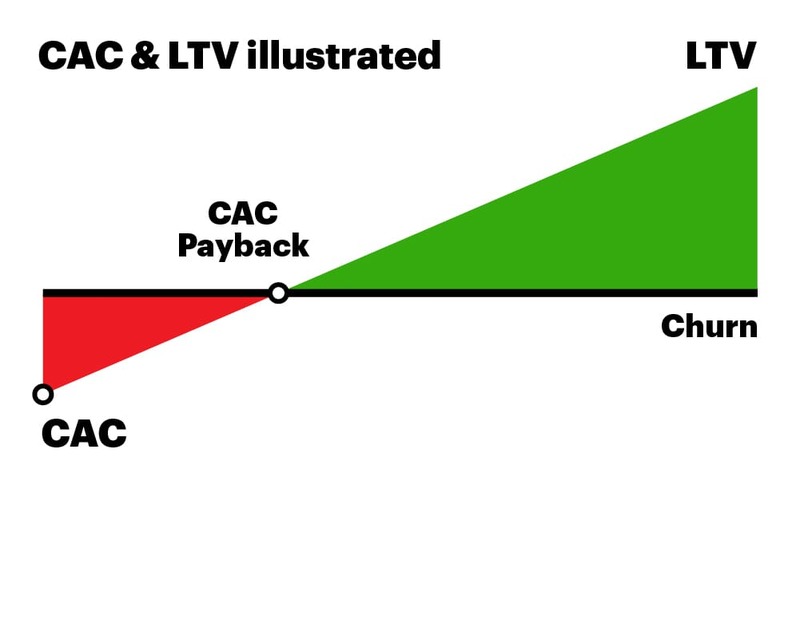 And he named the model AARRR as an acronym for acquisition, activation, retention, referral and revenue. At this stage the business should be mainly concerned with the number of customers it is getting and where they are coming from. They should be focusing on is identifying the channels that support their goals most and eliminate those inefficient. It differs from websites to apps. Some might define customer activation according to the number of clicks or the time they spent on site. While other may count the page views. 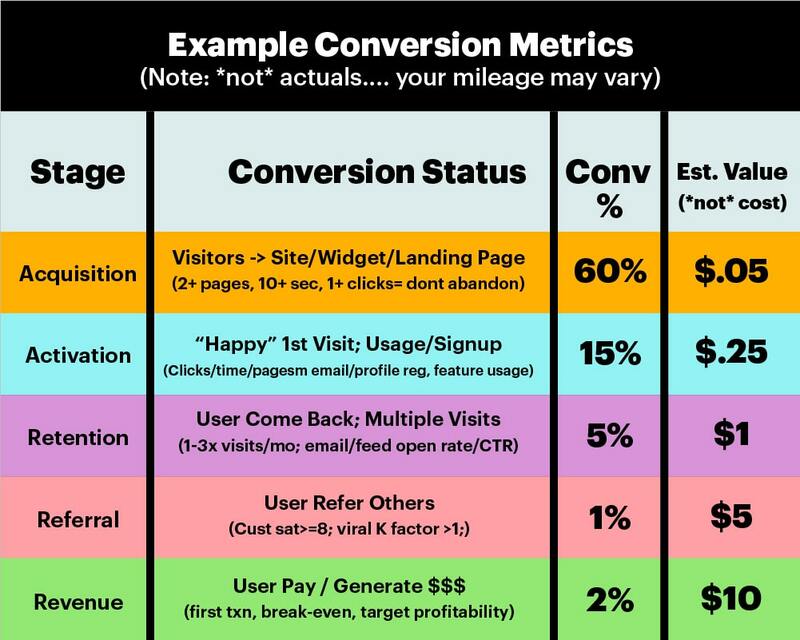 The metrics will vary but the desired goal is the same, measuring how happy was the customer first visit. This is determined by lots of A/B testing and placing features that visitors would love to engage with. Keep your audience hooked with on boarding emails and blog posts that address their pain points. Position yourself as a thought leader and they will keep coming, but they do, get ready with your analytics tool. Before going viral and asking people for recommendation, make sure that your product is worth it. The purpose of referrals is generating more buzz around your product. If that buzz is negative, then it’s better to stay hidden in the dark. Solving a problem and getting someone to pay for it and hopefully what they will pay will cover more expenses than what you incurred while building the product or acquiring the customer. What changed in the last two years is that the cost of building experiments is getting low while the ability to acquire new customers is high. Everyone can get a product out of the door but few can scale it to million users.